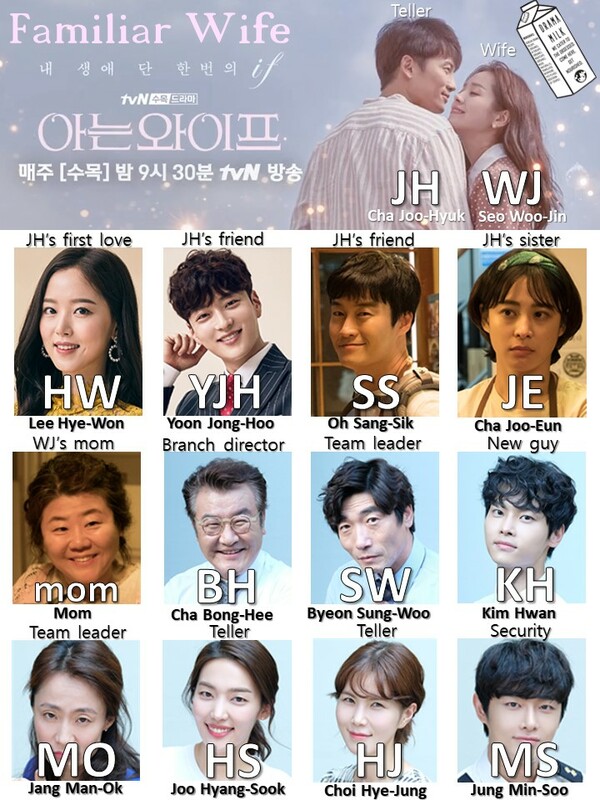 It’s been a busy morning, but I am happy to settle into this episode of Familiar Wife since it seems like the majority of the episode should be spent in the past. But do they hop back to the future this episode? Time to find out. We rewind a bit to when Joo-hyuk and Woo-jin are driving their cars and then dissapear to the past. Joo-hyuk wakes up in the past with his sister banging on his door, it is June 2006. Woo-jin wakes up as well with her old hairstyle. She is stunned. Her mother comes walking by talking mom stuff so she wonders, is it really 2006? Daebak! She asks her mtoher if appa went to work already? Umma says that he went to China for work. But Woojin thinks he needs to get a health check. Umma is all like, yeah, he can get a health check, he missed his last one. Woojin is all like, YES, HE SHOULD GET A HEALTH CHECK. She takes off like a bullet to the airport and finds her father. She gives him a huge hug and tells him that he has to get his health checked now. She is able to convince him so they walk out together. But while walking, Woojin sees Jong-hoo pleading with his girlfriend or first love about their love life. She wants to leave him but he does not want her to. Woojin is able to help out by accidentally running into the girl so she drops all her stuff. Jong-hoo helps her pick it up and tells his girlfriend that he wants to marry her he will be better he really wants to marry her. Maybe not right now, but after college? She loves that so they make up. In Joo-hyuk’s place, his sister is hanging out in his room along with Sang-sik. he is still under the covers. It looks like he is trying to avoid Woojin, he has one day to avoid her. But Woojin knows what he might be trying to do, so she is trying to find him. Woojin walks around looking for him and thinks that all the styles are so old fashioned. She gets to the school and runs into Sang-sik. He is all like, um, who are you? She tells him and then asks about Woojin, where is her? SS tells her that he is sleeping in his room. She tells him that she is in a hurry, can you take me there? But SS does not want to take her there because he does not know her. She is all like, I am jin shim re-al (a contemporary word for I am real, but real is pronounced like Real Madrid). He is all like, what does that mean? She pulls him away and tells him that looking old is a good thing for when you get old. He is all like, are you talking about me? She says yes. He says he is a scary person when he is angy and he is also chrasmatic. She tells him taht he has a cute side. They keep walking but then Hye-won runs into the both of them, it looks like she is happy to see SS and asks where Joo-hyuk is. SS thinks today is so strange, why does everyone want to see Joo-hyuk. Woo jin says something under her breath, everyone is all like, huh? But Woojin does not explain it (not sure what she said). They keep walking. SS calls Joo-hyuk and tells him that they are on the way to his house with a cute girl. Joohyuk tells him not to come! But SS says that they are already there, how can they leave? He hops up and takes off running, his sister yells after him, you are supposed to give me bus money! Woojin and SS get to the house but Joo-eun says that oppa left. He talked to someone and then ran away, he was super surprised. She asks her who she is, a girlfriend? Woojin tells Joo-eun that she is very happy to see her, they can catch up later! She takes off. She is able to run and catch up with Joo-hyuk. He is all like NOOOOOO and takes off running to a taxi. But she catches up and hops in as well. The taxi drives off as they both catch up. She says that she wants things to go the way they should go and he says that he does not want to! He gets out and takes off running. But she gets out to run as well. However, a scooter delivery man is riding his scooter and is about to hit her. Joo hyuk sees this before Woojin does and is able to run back just in time to pull her away. They both crash to the ground. Woo-jin wakes up and is older again. It is August 8 2018. Her mtoher comes in and looks very normal. She sits with her business clothing on and combs her own hair. Woojin is all like, what is going on? re you okay? Umma is all like, of course I am okay. Do you think I would have dememtia at this age? Woojin asks where appa is. Umma says that he died 3 years ago. She never has dreams of him, maybe it is because he feels bad about her taking care of him in the nursing home. Tell your appa to come to my dreams if you see him. The most comforting thing is that your appa died peacefully. What I really want is for you to get married. Umma puts on her glasses so Woojin asks why she is wearing glasses. her mother tells her that she is the #1 salesperson due in large part to her perfect image. Woojin asks if she is a sales queen? She tells Woojin that Woojin’s work people basically bought most of it. But it looks like Umma is actually involved in a pyramid plan, lol. Woojin asks this and umma hits her, it is a real business! Woojin goes to work and does everything as normal. it seems like she knows what has happened since high school. She sees her team leader and asks her if she wants to have a little drink with her. They go have a juice drink to catch up. Woojin asks her if she is busy in HR. HR is a pretty busy department right? Woojin tells her that she was thinking of working int he field at Gayung Branch near her home. HR says that is a good branch, the head manager is a good person. They have good managers too, I heard everyone is nice. Woojin asks if Cha Joo-hyuk is still there. HR woman tells her that he has been off work for a while now, she is not sure why, but he has paused work for a couple months now. JONG-HOO CLEANS Joo-hyuk’s desk and wonders where he is. Everyone asks if he contacts him. Joo-hoo says that he sends him text messages every once in awhile to let him know that he is alive. All the team members think that the place is not the same without him around. Maybe he had too much stress? MO and SW argue playfully about who is the best manager. But then Jong-hoo gets a call from his wife and kids and happily talks to them. The two tellers look at him and wonder if he is the same person that was so concerned about his friend? He likes his wife and kids so much. Jong-hoo smiles at his life and SW tells him to get back to work. SS and JE are at a food truck, it looks like SS works at it and SS is sitting outside eating there. She might work there as well because she is cleaning plants. But she is annoyed with her brother. JE thinks they should try some shamanism to make her brother stay in one spot. SS said if shamanism worked then he will sell his truck. JE grumbles that this truck is their future, because of Oppa I can’t even talk about you and me to my parents. SS says that he was like that in college as well. He just dissapeared and came back during summer vacation as well. How can he just be like that for 10 years. the sister says that no one makes him do it, he just decides to do it. SS worries a lot about him, does he eat? JE is all like, are you his sister or am I his sister? SS just wonders, is he dead somewhere? Joo-hyuk is in the countryside sleeping on a bus bench. He looks like a backpacker with no money to his name. He wakes up and gathers his things then sets off again with his huge back all fastened on. Then he wakes up again. Perhaps this is when he first woke up after coming back to the future. He wakes up in a tent and looks shocked to be there. He runs outside to look around and looks at his things in the tent. Then he checks his phone. He has several texts from his family and friends that worry about him. Where are you….I’m going to call the police…. Woo-jin goes to the restaurant that Joo-eun used to own, but it is another place that is booming. It is owned by someone else and has another name (Su-oo Restaurant). She leaves and sees her mother walking home so she scares her playfully. They walk off together to go have some soju and chicken. They can diet starting tomorrow. meanwhile, Woojin is at another pergola park area. He is trying to nurse his food wounds from walking and decides to pour soju on it. He checks his message – Oppa, you should come back, we are all worried about you, this time it is so long – When you check this text then call me. We don’t have your back up yet, just come back, we are dying – I miss you! Just come! He lays on the floor of the jungja (pergola like outdoor building without walls) and thinks about going back to work. They all say their motto since they are all complete now. LET’S GO – TRUST – SHARE – NEW – BANKING. (something like that). They all settle in to work. Joo hyuk sees Jong-hoo’s picture with his wife and two kids. he looks happy and stunned by it. Montage of work. BH happily looks around and comments that now it feels like it is his bank again. After work, Joo-hyuk meets with his friends and jong-hoo. His sister and Sang-sik are happy and upset to see him. SS is so amazingly happy and his sister is uspet that he took this long to get back. They all go drinking together but the sister gives them alone time. Jong-hoo tells them that his wife gave him the night off since Joo-hyuk is back. They all cheer to that. They ask him what he has done this entire time. He says he just walked and walked and walked. They don’t understand him, how can he not get married and have kids. You have a great job and everything. They wonder if he likes women at all. SS is all like, if he did not like women then he would not just let me be alone like this. They keep jocking like that and talking about traveling and dating and why he isn’t married. He says he likes traveling, there are no perfect people, I want to live by myself. I dont want to make anyone unlucky because of me. After their fun evening, they all wait to send Joo-hyuk off in a taxi while shooting “I love you’s” at him. He gets in the taxi, and the taxi driver is the magic ajusshi. He looks happy and even waves at Joo-hyuk, he remembers him. JH – Ajusshi! You are handsomer than before. A – you look skinnier and worse. JH – Yeah…I have a question, why was it me?….why to me? A – Just…you wanted it to much. If you live like that then you will hate more and regret more. Getting used to it is a double edged sword. You just live because you cant die. You can live with giving up everything, but, it is a sin to live unhappily. Human beings are just stupid, so when you don’t experience it, you cant realize it. Whatever it is. I used to be a doctor, a super famous OBGYN. But I had medical malpractice so I went back to change what happened, but then I was greedy for something else and my life was broken. JH – How did you recognize me? A – I don’t know, maybe I am paying for my sin. I am just a messenger between God and humans in the world. There are a lot of people that want to explore uncharted territories. The choice is what they choose. Joo Hyuk sees the coins in the car. A – You should not torture yourself anymore. Be happy…..your ex-wife, have you heard anything about her? He pulls the taxi over so JH can get out and another man hops in. the taxi driver winks at Joo-hyuk and drives off. Joohyuk thinks his neighborhood is the same. Then he thinks about his ex-wife and calls her company to see if there is anyone names Seo Woo-jin there. The HR person sounds like shepicked up and tells him that she already went home. he thinks that she is still at the main branch. But then he sees her getting off the bus that just stopped there. She does not see him. he follows her as she walks home. he watches her and smiles as he follows her. She stumbles for a moment from her shoe coming off and then fixes it. She keeps walking. But then she turns so he has to hid quickly. She wonders why the light is off at her house gate, is it broken? She goes inside so Joo-hyuk hops out of his hiding spot to try and see her go inside. Then he fixes the light. It might have taken forever because he comments, ahhhh I’m done. But then Umma walks up on him and asks him who he is, why are you looking at someone elses house? Joohyuk hops back in fright and tells her that the door color is nice. Umma does not recognize him. Joohyuk looks at her closely and tells her that she looks healthy. She is all like…yeah…do I know you? He tries to leave, but then she stops him and pulls him to a cafe (to sell him something, lol). She has all of her sales things out and talks to Joo-hyuk about how all her items are really good quality. She asks “Are you dry?” (gun sung) He says, “I am oily (Ji-sung)” (his name is Ji-sung in real life so it is an inside joke). Ji-sung tells her that he will buy everything. She is all like, what? All of this? He smiles and nods. Umma gets home and tells Woojin that she had a really good customer. He just showed up out of no where and asked for everything. He looked a bit dumb, he is not my son in law, if I had that kind of guy then I could sell everything. Woojin sits up and asks if she is happy so Umma starts to talk about how sales is not easy. She usually does not sale out, she has to work so hard to be the best. They keep joking about the business. Woojin thinks that she will have her best moment also. Joohyuk gets home and lives in Jong-hoo’s previous studio apartment. He sits comfortably and smiles to himself softly as he looks around. The next morning, everyone works hard at the bank. Jong-hoo and Joo-hyuk talk playfully as a customer comes up. He want to increase the limit on how much he can borrow in his account, right now it is $9k but he wants to increase it to $15k. Joo-hyuk starts to work on this, but the man has so many credit loans o it is difficult to increase it now. The man asks if he can put his okd bank account together, he is busy – . SW comes by and tells JH that BH wants to see him so JH gives the work to Jong-hoo. The customers name is Park Yoo-shik (from Secretary Kim, lol). Jong-hoo starts to change up the bank account in the way that the man wants him to, but he makes a mistake and adds one account wrongly. But he does not notice this. The customer kept saying, hurry hurry hurry. Joo-hyuk goes to the main branch for training. He is a bit nervous because he knows that this is Woo-jin’s place. And of course he sees her right away so he hides. Instead of going up the elevator, he goes up the stairs. Everything he does is nervous as he looks around for Woo-jin as he goes about what he is supposed to do. She tells him, nice to see you again Mr. Cha Joo-hyuk. They go to talk. She tells him that it has not been that long since they saw each other. She asks him what he has been up to and he is all like….just stuff. So she mocks him and says the same thing. But then she says that she has not given up on him yet, so wait for me. I will be back. She walks off mumbling something and then calls her team leader. She wants to move to the Ga Young branch. She heard that they had a teller position available. Joohyuk leaves thinking about how Woojin told him that she has not given up yet. He walks back to his company. Everyone is talking about how there was a basic mistake. JH asks Jong-hoo what is going on. Jong-hoo says that it is a same name case. Park Yoo-shik and Park Yoo-shik, the names are the same so the bank accounts were combined on accident. Joo-hyuk is all like, OMG, that was my guy. Cut to the two of them getting yelled at. They have to put back $8200 right away. It was a short yelling at session, so Joo-hyuk tells Jong-hoo that he should be more careful. They both have to fix this so they call park Yoo-sik to bring him back to the bank to fix this. But PYS says he is too busy right now. They try to tell him that the other customer is upset, but PYS says he is too busy and hangs up. He is about to do it, but then he says the same things he did from Secretary Kim and excuses himself. He calls someone and tells them that he should have a gift or something since they made a mistake, so he is giving them a hard time. They find him there. He goes to the bathroom and is in the middle of a good poop but Jong-hoo asks him for his password. They stake out his place (either work or home) as they wait for Park Yoo-shik to walk on by. They finally see him walking up and hop out to get his password. They hold up the computer to him like serial killers and asks for his password. PYS jumps back in fright and finally gives them the password. Elsewhere, Woojin runs into Jo-eun and yells her name…JOOEUN AH! She does not know her so Woojin has to make something up about where she used to live for a little bit. They go eat. Joo-eun tells her that she has a good memory to remember her from the neighborhood. Woojin asks how her brother is doing. She tells her that he is a backpacker that does not want to get married because he makes women unhappy. Joo-eun is heating but feel nauseous. She thinks the food might have gone bad. Woojin smells it and thinks it is okay. But they don’t settle that issue because we cut to Woojin walking home and wondering about Joohyuk, he is worse than she expected. The team is meeting. The boss congratulates Jong-hoo and Joo-hyuk for solving that problem. They says that they created the issue so the boss is all like, I’m glad that you realize that. But then he tells BH that he thinks this happened because they do not have enough people. They need one more person to work here. BH thinks they need one more person as well. They mention that Hwan’s training is almost over so he can work in the money area. (Same conversation as before) So they bring hwan to the money area and they will hire a new teller which will end up being Woo-jin. Joo-hyuk realizes this and stands up, NOOOOO. Everyone looks at him. Joo-hyuk quickly thinks and says that Hwan will be a good teller, lets just make him a teller. They all start to argue about it because no one wants Hwan to work in their team since he is the biggest trouble maker. The boss asks Hwan what he wants. Hwan thinks about it and comes to the conclusion that he is fine with any option. Joo-hyuk tells them that he will work hard day and night! So it is settled, Hwan will be a teller and they will hire a money lending person. Woojin gets word of this and is confused, it is not a teller job? What happened? She finds the director of the bank (BH) and talks to him. But first, she helps him get a drink out. She jokes with him with old man jokes so he thinks she has a good sense of humor. She tells him that she saw him a few times in their company events and introduces her self. She wants to be a teller and asked to move but he wanted to hire a money lending person. She was so sad, she really wanted to work for him. He is flattered. She tells him that she also had a CFP (certified financial planner) license. he is impressed, that is great. She understands that it is difficult to change his decision but he says, well, we haven’t really decided yet. The sister tries to tell SS that she is pregnant. He is a bit dense about it. She tells him that her stomach is a little big, it will come out more…he is all like, it always looks like that….what? It will come out more? That is a big pro – . But then he gets it. She shows him the pregnancy test. He is all like…I told you I was tired that day. She tells him to shut up, now, do you want to get married first and then have the baby or have the baby first? He thinks, of course we have to get married first! But he is a bit worried since they don’t have their store yet. But she says that is not important, becoming a father and mother is what is important. He is very happy to hear the word appa and thinks they should probably tell her brother first. She says they should, but he is a little bit old fashioned. Suddenly, the two friends run up as if they have been chasing each other. They happily sit at the table. SS tries to tell them the important news, but then says that he will make udon! Woojin and Umma hang out at home drinking soju. Woojin thinks drinking soju with her is like a dream. Umma is all like, we do this all the time. They keep talking about her job of meeting people and talking and selling products gives her a lot of energy, otherwise she would have a more difficult time after her father died. Woojin wonders if she knew that appa was her destiny from the first meeting? She says that she did not becuase he did not have a good first impression. But then he wonders why Woojin is talking about destiny – do you have a man now? Woojin tries to play it off and starts eating a bit more playfully. At the bank, BH tells his two managers that he asked for a loan and they told him that he should get a teller. he decided to get one since Hwan is a multitasker. MO is so happy about it, SW is soooooo distraught about it. They both run off (one happily and one upset). BH also walks off very happily. Meanwhile, Jong-hooand Joo-hyuk are upstairs on the balcony having fun. But then Joo-hyuk knocks over a drink and it breaks. It seems like Joo-hyuk feels something is strange about this moment and looks around. Cut to Woojin walking up to the building. I love this new future for everyone. Now we just need to see how Hye-won’s life is right now. The time travel is a bit confusion at some parts, but that is to be expected in most time travel shows. JH – OMG, she is crazy. WJ – Wait!….yes, right I am interested in assistant manager Cha. BH – You guys look like a good pair. VO – Are you having “some”? Just sit over here. JH – Don’t do it! WJ – Lets live our own life. Lets do it. News – Bus 170 and a fright truck collided. there is congestion. From the obsessed – THANK YOU!!!!!!! !